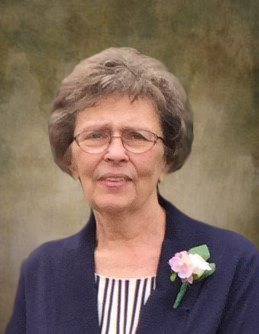 Funeral services for Karen Koubsky of Glenwood, Minnesota, will be held Saturday, April 20, 2019 at 11:00 a.m. at Indherred Lutheran Church, rural Starbuck, with Reverend Paul Johnson officiating. Visitation will be held Friday from 5 to 7 p.m. at the Starbuck Funeral Home in Starbuck and for one hour prior to services at the church on Saturday. Burial will be at Lake Ann Cemetery, rural Glenwood. Karen Daun Ihnen, daughter of Harry and Selma (Bremer) Ihnen, was born on October 13, 1944 in Lake Park, Iowa. At a young age, she moved to Glenwood, Minnesota and later to Lowry, Minnesota where she grew up and attended school, graduating from Glenwood High School in 1962. She was united in marriage to George “Pete” Koubsky on April 6, 1964 at St. John Nepomuk Catholic Church near Lowry. The couple made their home on George’s family farm in Reno Township, Pope County, Minnesota. To this union six children were born. Karen enjoyed being a farm wife, where they raised dairy cows, sheep and beef cattle. Other jobs that Karen did throughout her lifetime included cleaning houses for local people and working as a care assistant at Anna’s Place in Starbuck. George passed away March 6, 2011. Karen continued to live on the farm until 2016, when she moved to Edgewood Vista in Alexandria. In 2018 Karen moved to the Glenwood Retirement Village in Glenwood, where she continued to live until the time of her death. Karen enjoyed raising Collie dogs, gardening, cooking, baking, sewing, knitting, dancing and playing cards. Watching her grandchildren show livestock for 4-H was one of her favorite things to do. Most of all, Karen enjoyed spending time with family and friends. Karen died peacefully on Sunday, April 14, 2019 at the Glenwood Retirement Village in Glenwood. She was 74 years old. She is survived by her children: Peter Koubsky of Glenwood, Paul (Barb) Koubsky of Glenwood, Terri (Mike) Lundblad of Glenwood, Jody Koubsky of Alexandria and Philip Koubsky of Glenwood; five grandchildren: Haley (Robby) Radil, Kyler Koubsky, Lacey Koubsky, Chris Lundblad and Tim Lundblad; two great-grandchildren: Harper and Liam Radil; brothers-in-law: Richard Kaminski of Richfield and Eldon Munholand of Cross Lake; sisters-in-law: Elaine Koubsky and Dorothy Koubsky of Glenwood and 35 nieces and nephews. She was preceded in death by her husband; infant son, Gordon Koubsky; her parents; four sisters: Phyllis (Sylvester) Holle, Florence (Chet) Torguson, Vonnie Anderson and Jolene (Don Kellar) Munholand; one brother: Earl (Alpha) Ihnen; sisters-in-law: Mary Kaminski, Lillian Koubsky and Antonia Koubsky and brothers-in-law: Joseph (Janet), Charles and Frank Koubsky.